Which One Do You Want To Play? 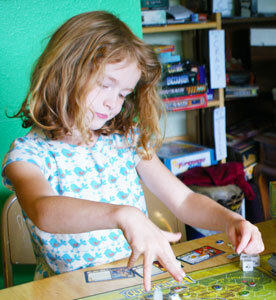 Since playing Story Realms, my daughter, Sabine, has become more and more interested in playing other adventure games. While she enjoyed Story Realms' imaginative tales, quick play time, and ability to play with her family and friends, she wanted to try some of my more traditional adventure board games. I wasn't so sure she'd enjoy them. Adventure games can be kind of long and complex. They often have lots of cards to read, combat systems, leveling systems, special equipment, and more. However, I thought we’d give some a try. The first one she was interested in was Talisman. There’s a new version out these days, but the one I own a 2nd edition box from 1985. I’ve seen the new version though and they really don’t seem that different. Here’s what Sabine had to say about Talisman. There are gold tokens that you can use at shops. And there are blue craft tokens and red ones. Oh and the red ones are for Strength. You try to move around the board to get into different places. You roll dice to move around the board. The places are the different rings around the crown. Whoever gets to the crown wins. The cards will have monsters on them and sometimes they will have gold. Sometimes they will have good things and sometimes they will have bad things. One player rolls for the monster and you roll for yourself. The monster will have a strength too. You can either beat him in craft or beat him in strength but you have to beat him to win the battle. As a player you start out neutral and there is a guy that can change to good or bad with a power. I like Talisman because it is just a very good game. I like that it’s a crown you are trying to get. Buying stuff is my favorite thing about the game. Also, I like what the board looks like. My favorite and kind of the only character that I’ve had before is a Troll. I like the Troll is very, very strong. And I like its skin color. The color of its skin is green. Though I don’t like the big bumps on him. They are brownish green. I would give this game a score of 100 billion. I really like the game. You can't tell, but I'm totally losing right now. Talisman went pretty well. That game is fairly simple and fairly random. My daughter ended up winning both games we played and I didn’t have to help her that much. I certainly wasn’t playing easy. Talisman is fun for its ridiculous variety, but there are so many random cards to turn over and so many die rolls that determine everything that you really can’t strategize. This makes it a pretty good choice for playing with the kids. Be warned though. Sabine had fun but started to lose interest towards the end. Even with 2 players, this game took almost 2 hours to play. After playing Talisman a few times, Sabine started showing interest in Runebound which is a way more complex game. I wasn’t sure if it would work or not, but we tried it anyway. Here’s what Sabine had to say. You see, it's like this! You move with symbols on the dice you roll. There are different symbols. You have to see if you have all the symbols to get to each place. Best to start with the green dot and level up to yellow, level up to the blue, and level up to the red. Somewhere in the red deck there will be a dragon, the one who you are trying to fight. But you are not working together. You are trying to defeat it first. The dots are things you put on the board. On the other side they have number. You draw the cards of that color to see what monster you have. Once you have a monster there will be a task you have to do before battle. Then you battle. There are different symbols for different things. They mean different things that you have to roll higher than on the bad guy. You get to add what you have of them to the die roll. You win the fight by getting higher than his score each time. I like Runebound because it has a red player. Well two, but I like to be a certain one. I liked the player I was because it was good at fighting. I also like what the board looks like. It has some forests. It has some rivers and roads. It has hills and mountains and that’s what the board looks like. I like the name of Runebound. If I were giving a score to this game I would say 300. Combat is kind of complex, but Sabine still loves to fight monsters! I was surprised how well this one went. Runebound has a complex movement system involving dice, symbols and terrain types. This game definitely took more prompting from me than Talisman, but Sabine actually got the hang of movement pretty quickly. She sort of understood combat, but I had to give her advice about when to attack on most fights. We played with the soft KO optional rule and also a house rule that you can heal all wounds by spending just 1 gold in a town. I actually recommend both of these rules for anyone playing Runebound. It takes away a lot of the drudgery of lost combat and speeds up the game a bit. We didn’t actually get to finish Runebound. We got interrupted about an hour or so in. Runebound takes even longer than Talisman, but it was still a lot of fun. Sabine says, "There can be no winner! Adventure games rock!" I had a surprisingly good time playing both of these with my daughter. If you and your child have the focus for 2 hour game, I’d recommend either one. However, I think Talisman is actually a little better suited for kids. It’s very similar to the “roll and see what you get” style of classic kids board games and the combat is as simple as rolling a die and adding 1 number to see how high you could get. The standard victory does involve getting to a magical crown and then killing off the other players, but we just played that first person to the crown wins. It’s not that far off from how the game usually goes. I have played a few adventure themed games that more designed for kids, but it was a lot of fun to play a “grown up” adventure game with my daughter. 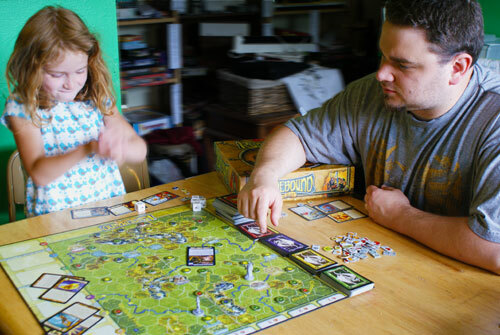 Have any of you had a good time playing an adventure game with your kids? Leave us a comment and let us know all about it! I have a guest post on my wife's blog, Muse of the Morning about how to have an easy, impromptu, family dance party. 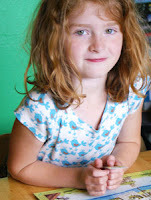 Her blog is filled all kinds of crafty stuff and great ideas for family fun. Definitely worth checking out! And it earns me brownie points at home if you do. My daughter Sabine, getting her groove on. As for this blog, it's been awhile since we've done a Story Realms Update so I will just say this. We've been talking about playtests for quite some time now, but we really are sending out print and play sets tomorrow for those that are interested. If you haven't already, go to Escapade Games and sign up to be playtester! 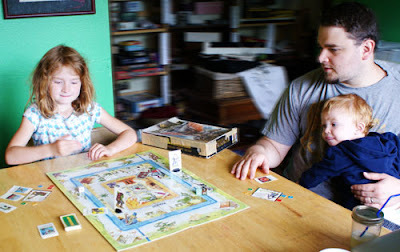 Other stories in family adventure gaming, my daughter Sabine has been getting very interested in adventure board games. 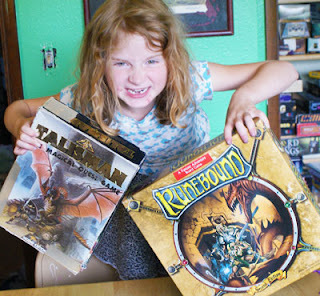 She's played the classic game of Talisman and also played Runebound 2nd edition. I'll be writing up her review of the experience later this week. Drooling over Goblins Drool, Fairies Rule! Wowed. That's what I was... wowed. I sat down to play a rhyming game with cutesy art with the kids, and I ended up playing a reasonably in-depth strategy game. That's how I felt after playing Goblins Drool, Fairies Rule. And I love this game. Stretch goal already met, box will be upgraded to a collectable tin!! Goblins Drool, Fairies Rule! is a game by David Luis Sanhueza of the Game-O-Gami game development studio. It is for 2-4 players, but also has a single-player variant for solitaire lovers out there. It consists of a deck of double-sided tarot-sized cards. Each card has a fairy on one side, and a goblin on the other, each with their own name, which rhymes with certain other fairies and goblins. The rules are very simple. On your turn, you play one of your cards (which are face-up in front of you). You check for a rhyme with other cards in the center (the Fairy Circle), and flip all cards that rhyme with the one you played. You then compare the symbol on the card you played with the ones in the Fairy Circle (for instance, Pixie Power rhymes with Dusty Dour, Petal Flower, Nappy Hour and Sweet and Sour), and take all that match the card played. And then play passes to the next person, until one person either has no goblins left, or has collected six fairies. See... simple, right? The brilliance of this game is its elegance. That above is basically the gameplay in a nutshell. But with five rhyming groups, and two sets of binary suit symbols (sun/moon and mushroom/frog), it can be as strategic as you care to play. 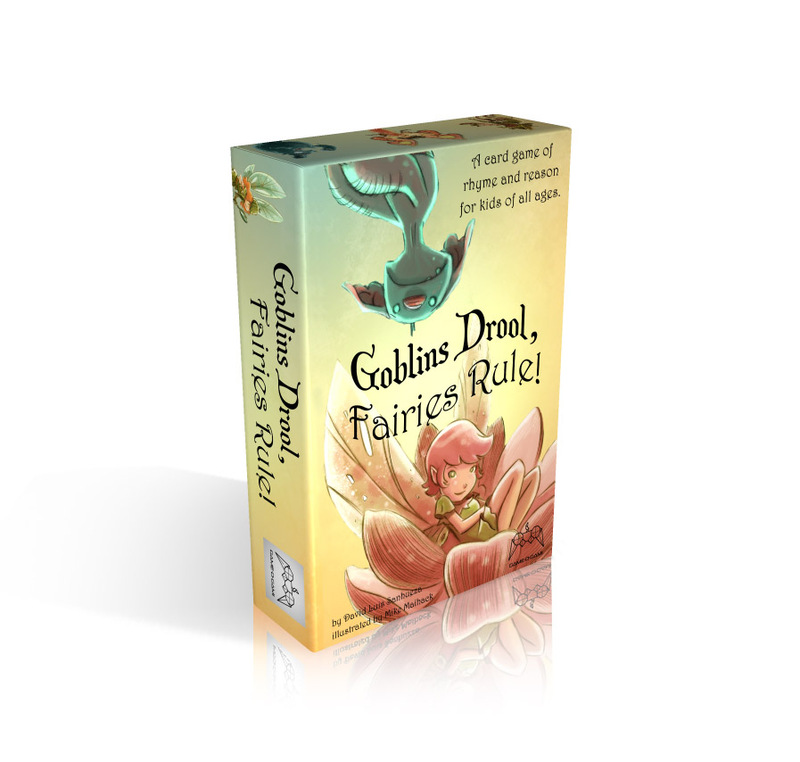 Since opponents' cards are face-up, you can plan your plays in such was as to prevent them from getting the fairies they need, or to try and make sure that they end up with a goblin. The emergent strategy should be enough to make even strategic gamers think hard... yet be able to play with young kids. I played this game with my daughter, and she loved it. My daughter is an emergent reader and this game was great for her. The theme and art appealed to her, and she got a chance to practice reading skills. It was a blast watching her sound things out. She found out quickly that you couldn't just compare the last couple letters to check for rhymes. I highly recommend this game. It is currently on Kickstarter and has met it's funding goal (and then some!) Now is your chance to get it and preorder a copy of this great game.. Some time after the Kickstarter campaign, of course, you'll be able to pick it up in stores, but there are some awesome rewards and stretch goals available only via the Kickstarter campaign, such as an art book, stickers and double-sided puzzle. You don't want to miss this one, it's an excellent game and GORGEOUS! Ok, maybe the grownups were getting a little too competitive with this one! But C'MON, FAIRIES RULE!! !